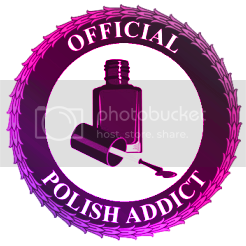 This is a quick post, again. 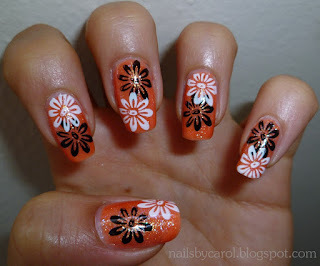 I really loved this manicure, I started with 2 coats of Baby Orange by Nabi and 1 coat of 9021Orange by Wet n Wild. If you see little blue/green specks it's because I added a coat of Sinful Colors Pearl Harbor glitter to give it dimension. 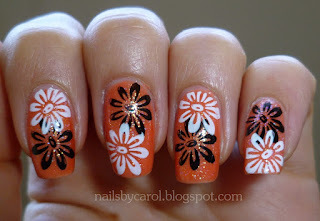 The flowers are from plate SE19 and I stamped with the polishes Black Creme from Wet n Wild and Konad White. Ésta es una entrada breve, otra vez. Me gustó mucho este diseño, empecé con 2 capas de Baby Orange de la marca Nabi y después una capa de 9021Orange de Wet n Wild. Si logras ver brillos verdes/azules es porque apliqué también una capa de la brillantina Pearl Harbor de Sinful Colors. 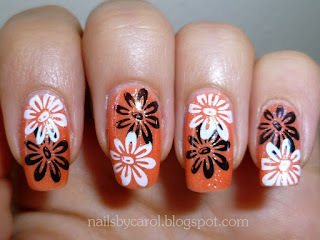 Las flores son del platillo SE19 y estampé con los esmaltes Black Creme de WnW y Konad White. Que bello para comenzar la primavera. Just a tiempo para ello :) Ya hace falta un poco de sol y calor!